For VW Type 1, 002 Bus, 091, and MD Series Transaxles. Because of their small size, reverse gears have always been a weak point in VW gearboxes. To address this problem, Weddle Industries makes a complete line of heavy duty "Weddle Racing" reverse gears. These gears are manufactured to the very highest quality standards and offer a significant improvement over the original VW gears. Weddle has recently expanded their line of VW reverse gears by introducing two new versions (see below). Weddle Racing Gears are made from a proprietary spec, fine grain vacuum melt steel, each bar of which is ultrasound tested for internal defects prior to machining. 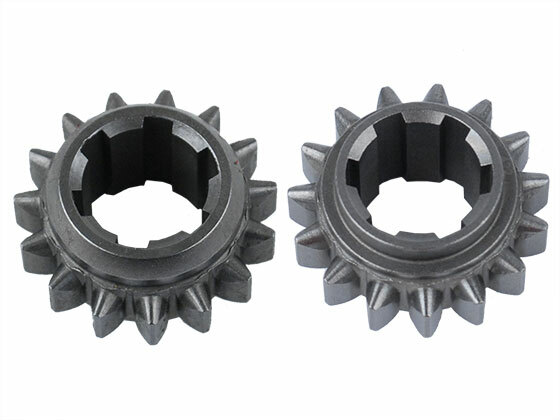 Computer aided gear tooth design maximizes the strength and durability of each ratio, and precisely controlled manufacturing ensures consistent quality control. All of our gears go through a special multi-phase heat-treat and cryogenic process that greatly increases tooth strength and fatigue resistance. Finally, all gears are shot-peened, and the bearing and thrust surfaces are precision CNC ground. Many of the hardest running vehicles in the world have proven that these gears can withstand abuse that causes other brands of gears to fail.